Daily supply of water to South Sudan refugees living in Bidi Bidi Refugee Settlement in Yumbe District has finally overtaken the emergency water supply threshold. The supply recently crossed the emergency threshold of 15 litres per person per day following the commissioning of series of newly constructed underground water treatment plants. Mr Acacio Jafar Juliao, the Head of Sub Office of the United Nations High Commissioner for Refugees (UNHCR) in Yumbe says the current daily supply stands at 16 litres per person per day, just one litre above the emergency threshold. Mr Juliao says crossing the emergency threshold is a significant gain made in eliminating persistent water crisis in Bidi Bidi refugee Settlement. 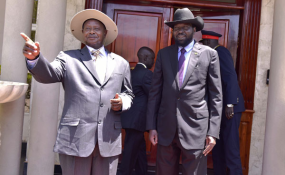 He says before crossing the threshold, agencies had to collect and treat water from River Nile, a distance of more than 50 Kilometres using water bowser tracks for refugees to access water every day. On Thursday, UNHCR officials commissioned two additional motorised water treatment plants to supply water to 6,500 refugees who are still stuck below the emergency daily water supply threshold. Ms Sheila Akullu, the UNHCR wash officer says the two plants will propel the 6,500 refugees in the two villages affected by persistent water crisis, to 20 liters per person per day, well beyond the emergency daily water supply threshold. "The project that we just visited today (Thursday) is just in two villages of the five zones. It is supposed to give the two villages 20 litres per person per day, at the moment it's 14 litres. By May this year, the project should be operational, what is left is just the pipeline and solar installation," she said. The two motorized water treatment plants were constructed using donations of €100,000 (Shs 418 million) by Equatorial Coca Cola, a franchise of Coca Cola united in South Sudan. Mr Mark Hoogendam, the Managing Director of Coca Cola Equatoria said they were prompted to intervene in the lives of the Refugees by a 2018 Board decision on Corporate Socia responsibility. Ms Maureen Kyomuhendo, the Public Affairs and Communications Manager of Coca Cola Beverages Africa in Uganda said delivering water to the refugees is part of a major ongoing project to deliver clean and safe water to water-stressed communities across the region. Mr Rogers Mugenyi, the Emergency Water Officer of Water Mission Uganda says Villages Nine and Ten were lagging behind as far as access to clean and safe water is concerned. "With the help of the motorized systems in place, the persisting water crisis in the area should be history," he said. Northern Uganda and the West Nile last experienced the worst water crisis in 2016 following a devastating drought reportedly triggered by Oceanographic changes in the Indian Ocean. The rights to safe drinking water and sanitation is a fundamental human right embodied under the Universal Declaration of Human Rights. It states that 20 litres per capita per day is a minimum quantity required to realise minimum essential levels of the right, but there remain significant health concerns to achieving the right universally. To ensure the full realisation of the right, it is recommended that States should aim for at least 50 to 100 litres per person per day.